Iron sights are a system of shaped alignment markers (usually metal) used as a sighting device to assist in the aiming of a device such as a firearm, crossbow, or telescope, and exclude the use of optics as in telescopic sights or reflector (reflex) sights. Iron sights are typically composed of two component sights, formed by metal blades: a rear sight mounted perpendicular to the line of sight and a front sight that is a post, bead, or ring. Open sights use a notch of some sort as the rear sight, while aperture sights use some form of a circular hole. Civilian, hunting, and police firearms usually feature open sights, while many military battle rifles employ aperture sights. The earliest and simplest iron sights are fixed and cannot be easily adjusted. Many iron sights are designed to be adjustable, so that the sights can be adjusted for elevation or windage. On many firearms it is the rear sight that is adjustable. For precision applications such as hunting or sniping the iron sights are usually replaced by a telescopic sight. 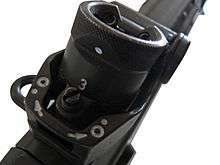 Iron sights may still be fitted alongside other sighting devices (or in the case of some models of optics, incorporated integrally) for back-up usage. Rear sights are usually mounted in a dovetail on the barrel or receiver, closer to the eye of the shooter, allowing for easy visual pick-up of the notch. Front sights are mounted to the barrel by dovetailing, sweat soldering, screwing, or staking close to the muzzle, frequently on a ramp. Some front sight assemblies include a detachable hood intended to reduce glare and if the hood is circular, then this provides a reference where the eye will naturally align one within the other. 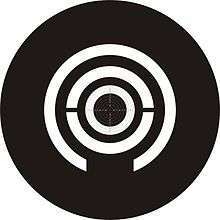 Even a tiny error in the angle of sight alignment results in a trajectory that diverges from the target on a trajectory directly relative to the distance from the target, causing the bullet to miss the target; for example with a 10 metre air rifle shooter trying to hit the 10 ring, which is merely a 0.5 mm (0.020 in) diameter dot on the target at 10 m (33 ft) and with a 4.5 mm (0.18 in) diameter pellet, an error of only 0.2 mm (0.0079 in) in sight alignment can mean a complete miss (a 3 mm (0.12 in) point of impact miss). At 1,000 m (3,300 ft), that same misalignment would be magnified 100 times, giving an error of over 300 mm (12 in), 1500 times the sight misalignment. [note 1] A long sighting line, called the 'sight radius', helps to reduce eventual angle errors and will, in case the sight has an incremental adjustment mechanism, adjust in smaller increments when compared to a further identical shorter sighting line. Sights for shotguns used for shooting small, moving targets (wing shooting or clay shooting) work quite differently. The rear sight is completely discarded, and the rear reference point is provided by the correct and consistent positioning of the shooter's head. A brightly colored (generally brass or silver colored, white, or a fluorescent shade) round bead is placed at the end of the barrel. Often this bead will be placed along a raised, flat rib, which is usually ventilated to keep it cool and reduce mirage effects from a hot barrel. Rather than being aimed like a rifle or handgun, the shotgun is pointed with the focus always on the target, and the unfocused image of the barrel and bead are placed below the target (the amount below depends on whether the target is rising or falling) and slightly ahead of the target if there is lateral movement. This method of aiming is not as precise as that of a front sight/rear sight combination, but it is much faster, and the wide spread of shot allows a hit even if there is some error in aim. Some shotguns also provide a mid-bead, which is a smaller bead located halfway down the rib, which allows more feedback on barrel alignment. Open sights generally are used where the rear sight is at significant distance from the shooter's eye. They provide minimum occlusion of the shooter's view, but at the expense of precision. Open sights generally use either a square post or a bead on a post for a front sight. The post or bead is placed in the rear sight notch, and the target is placed above and centered on the aligned sights. 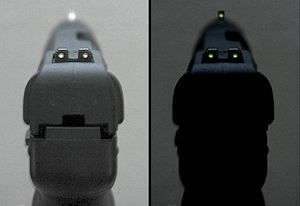 From the shooter's point of view, there should be a noticeable space between each side of the front sight and the edges of the notch; the spaces are called light bars, and the brightness of the light bars provides the shooter feedback as to the alignment of the post in the notch. Vertical alignment is done by lining up the top of the front post with the top of the rear sight, or by placing the bead just above the bottom of the V or U-notch. If the post is not centered in the V or U notch, the shot will not be accurate. If the post extends over the V or U-notch it will result in a high shot. If the post does not reach the top of the V or U-notch it will result in a low shot. Other common open sight types include the buckhorn, semi-buckhorn, and express. Buckhorn sights have extensions protruding from either side of the rear sight forming a large ring which almost meets directly above the 'V' of the notch. The semi-buckhorn is similar but has a wider gently curving notch with the more precise 'V' at its center and is standard on classic Winchester and Marlin lever-action rifles. Express sights are most often used on heavy caliber rifles intended for the hunting of dangerous big game, and are in the form of a wide and large 'V' with a heavy white contrast line marking its bottom and a big white or gold bead front sight. In cases where the range is close and speed far outweighs accuracy (e.g. the shooter is being charged by dangerous big-game), the front sight is used like a shotgun bead; the rear sight is ignored, and the bead is placed on the target. When more time is available, the bead is placed in the 'V' of the rear sight. These sights are used on target rifles of several disciplines and on several military rifles such as the M1 Garand, the No. 4 series Enfields and the M16 series of weapons along with several others. Peep sights are very effective in poor lighting, and have found favor with a few hunters who hunt in heavy cover. The ghost ring sight is considered by some to be the fastest type of aperture sight. It is fairly accurate, easy to use, and obscures the target less than nearly all other non-optical sights. Because of this, ghost ring sights are commonly installed on combat shotguns and submachine guns (and to a much lesser extent, rifles). The ghost ring is a fairly recent innovation, and differs from traditional aperture sights in the extreme thinness of the rear ring, and the slightly thicker front sight. 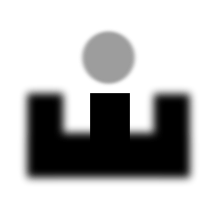 The thin ring minimizes the occlusion of the target, while the thicker front post makes it easy to find quickly. A ghost ring can also take form of a tube ranging from 3 to 6 cm long, with the post mounted at the inside end of the tube. This type of ghost ring is used when there can be no front sight at the front end of the barrel. It is slightly slower to use, because the shooter's eye has to focus close on the post, then focus on the target. However, in situations when extremely fast sighting is required, the shooter can simply look through the tube, and it is simple to see if the view is straight down the tube. Target aperture sights are designed for maximum precision. 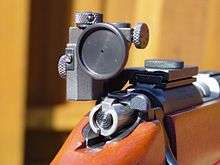 The rear sight element (often called diopter) is usually a large disk (up to 1 inch or 2.5 cm in diameter) with a small hole in the middle, and is placed close to the shooter's eye. High end target diopters normally accept accessories like adjustable diopter aperture and optical filter systems to ensure optimal sighting conditions for match shooters. Typical modern target shooting diopters offer windage and elevation corrections in 2 mm (0.079 in) to 4 mm (0.157 in) increments at 100 m (109.4 yd). Some International Shooting Sport Federation (ISSF) (Olympic) shooting events require this precision level for sighting lines, since the score of the top competitors last 10 shots is expressed in tenths of scoring ring points. Rifles from the late 19th century often featured one of two types of aperture sight called a tang sight or a ladder sight. Since the black powder used in muzzleloaders and early cartridges was not capable of propelling a bullet at high velocity, these sights had very large ranges of vertical adjustments, often on the order of several degrees, allowing very long shots to be made accurately. The .45-70 cartridge, for example, was tested by the military for accuracy at ranges of up to 1500 yards, which required 3 1⁄3 degrees of elevation. Both ladder and tang sights folded down when not in use to reduce the chance of damage to the sights. Ladder sights were mounted on the barrel, and could be used as sights in both the folded and unfolded states. Tang sights were mounted behind the action of the rifle, and provided a very long sight radius, and had to be unfolded for use, though rifles with tang sights often had open sights as well for close range use. Tang sights often had vernier scales, allowing adjustment down to a single minute of arc over the full range of the sight. Aperture sights on military rifles use a larger aperture with a thinner ring, and generally a simple post front sight. The extreme case of this is the ghost ring sight, a relatively recent innovation that may be the fastest type of iron sight to use, while still providing a degree of precision comparable to or better than most open sights. Ghost ring sights are commonly found on riot and combat shotguns and customized handguns, and they are also gaining ground as a backup sighting system on rifles. Since shotgun beads are only used by the peripheral vision, generally a larger, brighter bead works best. Fiber optic sights are becoming popular for shotguns, as they greatly increase the brightness of the bead by collecting light and directing it to the shooter's eye. Since the "rear sight" in the case of a shotgun is the shooter's eye position, adjusting the "sights" on a shotgun consists primarily of adjusting the stock to fit the shooter as well as possible. 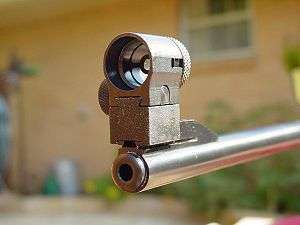 Bead sights are inferior in practical accuracy compared to rifle and ghost-ring sights, as they provide no rear sight to verify correct alignment with the front sight. While bead sights may be acceptable on sporting shotguns, they are best avoided for use on combat shotguns. The primary advantage of bead sights is that they do not interfere with the shooter's field of vision, allowing extremely rapid target acquisition, which is essential for fast moving targets such as clays and game. They are less expensive than rifle and ghost-ring sights. 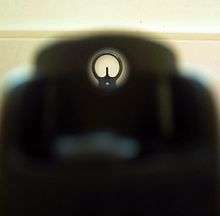 While target shooters generally prefer a matte black finish to their sights, to reduce the chance of glare and increase the contrast between the sights and the light bars, black sights don't offer good visibility with dark targets or in low light conditions, such as those often encountered in hunting, military, or self-defense situations. A variety of different contrast enhancements to the basic Patridge type sight and others have been developed to address this deficiency. It should be noted that the contrast enhancement of the front sight has to be somewhat larger compared to the contrast enhancement(s) used for the rear sight if all contrast enhancements should appear about equally large from the shooters perspective. 1 2 3 4 5 6 7 8 9 Hawks, Chuck. "Choosing the Right Sight", Chuck Hawks Web site. Retrieved July 24, 2008. ↑ Burdge, Robert J.; Kerr, Douglas A. "Parallax Suppression with a Target Rifle Aperture Sight" (PDF). Retrieved 6 February 2015. 1 2 3 "Description Of Sights" Novak Sights Web site. Retrieved July 29, 2008. ↑ "Sight Accessories - .126 White Outline Rear Sight Blade Kit" Smith & Wesson Web site. Retrieved July 29, 2008. ↑ "Heinie Straight Eight Sights" Heinie Specialty products Web site. Retrieved July 29, 2008. ↑ "Handgun Sights" Kimber of America Web site. Retrieved July 29, 2008. ↑ Hawks, Chuck. "AmeriGlo Independent Light Tritium Night Sights", Chuck Hawks Web site. Retrieved July 29, 2008. ↑ "Novak Fiber Optic Sights" Novak Sights Web site. Retrieved July 29, 2008.